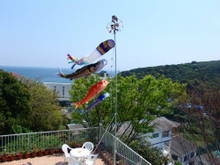 My son and I set up Carp Streamers for children's day which takes place on May 5th this afternoon. The children's day is a Japanese tradition to celebrate Japanese boys and we pray that they will grow up healthy and strong. Today it was a second day of Shirahama shrine festival. A lot of people come to this shrine and they watched the traditional dance performance. And after that they had a ceremony to tell the opening of festival to the gods on the seven islands on the pacific ocean. Actually it is held on the first day, but they changed the date because of rain yesterday. 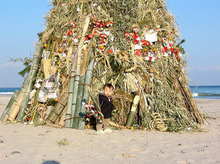 Shirahama shrine which has a long history of more than 2,400 years has the festival on October 28th, 29th and 30th. Today it was an eve of this festival and the young boys and girls who are second year students in junior high attended the ceremony which was held in the main shrine. 2011/05/08 Koinobori - - Carp shaped flags were swimming in the blue sky! 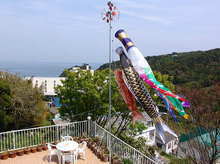 We had a lot of customers last year at Pension Sakuraya in Shimoda. In Japan we, Japanese cereblate the new year's day on January every year. It is considered by most Japanese to be one of the most important annual festivals and has been celebrated. At Sakuraya we decorate the room and many places in the building with the flowers like this. In all Japanese style rooms we put the flower pot with the seasonal flowers and the leaves. Let us wish you and yours a happy and healthy New Year. As it had been cloudy and sometimes rainny in these days we couldn't do it. It was very warm today, so I wen to Shirahama beach with my son, Yuuki. It was first time for him to walk by himself for the long time on the sand. He was very excited and had a good time, I guess. By the way as you saw in this photo, there was a "Dondo Yaki" in the beach. "Dondo Yaki" is the Japanese traditional bonfire performed at the beginning of New Year. 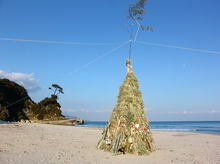 We, Japanese bring "Okazari" or " Shimenawa", the decorations for the New Year celebration, and burn it in the early morning. The tradition says that the smoke of Dondo Yaki bring good health and good luck. I guess that we can not see this traditional event in the big city in Japan, but would you like to see it? It will be held on Sunday, January 15th. Good Luck with you!